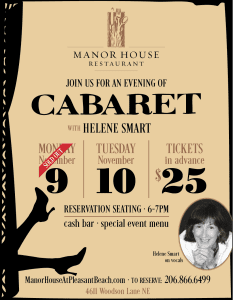 Helene Smart will sing cabaret-style songs over dinner at the Manor House, in Lynwood Center, November 9th and 10th. Reservations are required. Helene has always loved to sing since she was small. She sang with her family around campfires, in musical comedies during school and community theater but has hit upon a type of music she resonates with and she loves to share it with her audiences. It’s cabaret style. 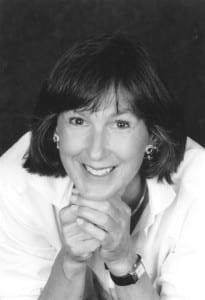 She got her start in cabaret music on the island at Bainbridge Performing Arts. Dennis Faust, the director, asked her to extend the play he was directing and fill out the evening by singing songs that related to that play. While she researched songs for the play, she realized how much she liked songs that told a story, hence her start with cabaret music. Cabaret songs are sung in an intimate setting with words that portray stories. Helene chooses her songs very carefully thinking about her audience. Will they appeal to a wide range of people? Will they portray the story she wants to tell? Which songs can be strung together to deepen the impact of the story? Choosing music is a pastime Helene loves. As she says in the podcast, it enable her to rediscover music she hasn’t heard for a while or to discover new songs that were recorded long ago. She tries to find songs that are whimsical and humorous because they get the point across in a fun way. Does she write her own songs? In one case, yes. She collaborated with a friend and wrote the song “The Name Song” which is about the pronunciation of her name. It is a humorous, clever and light song about the frequent experience of hearing people mispronounce her name. On November 9th and 10th, the Manor House at Pleasant Beach will feature Helene accompanied by a musician at the grand piano. The 9th is currently sold out; in which case, try reserving for the 10th. Dinner reservations are for 6pm only and are accepted by calling the Manor House at 206-842-8439. For further information, check the Manor House website. Credits: BCB host: Carrie West; BCB audio editor: Barry Peters; BCB social media publisher: Valerie Adkins.